Another in our ongoing series of occasional reviews of cigars given to us as gifts. Featured this time is the CAO Vision Prana, given to me by my friends at 10-7ha back in January of this year. Produced by La Aurora S.A. for C.A.O. International, these cigars come packaged in their trademarked Sensi-Box, a beautiful white humidor with a digital readout on the front. The current Cigar Aficionado rating for it is 90 (Aug ’07). 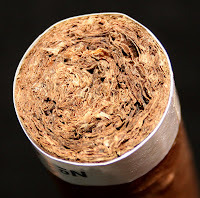 Following Cigar Aficionado's 4-part rating system (Appearance & Construction, Flavor, Smoking Characteristics, and Overall Impression) I sat down to rate this cigar while enjoying a glass of Basil Hayden bourbon. With a graceful conical-shaped head, it appeared very well-constructed. It drew alright and everything started off real nice until, bam! It split at about the mid-way point. From then on it went down hill. Though I tried my best to keep it together, there was no hope and a few minutes into the second half I had to put it down. The flavors before the meltdown were quite pleasant. A bit of cedar or sandalwood and a touch of nutmeg had me very interested through the first third. It did start to go a little tannic on me before bursting, but ultimately, it’s a little tough to give this cigar a thorough evaluation – which is a sizable disappointment because the robusto Vision I had about a year ago was pretty darn good. It’s a shame this one came apart on me as I was pretty optimistic about how good it was going to be. My rating for the CAO Vision Prana is 77. Nonetheless, I did appreciate the gift and look forward to trying one again soon.